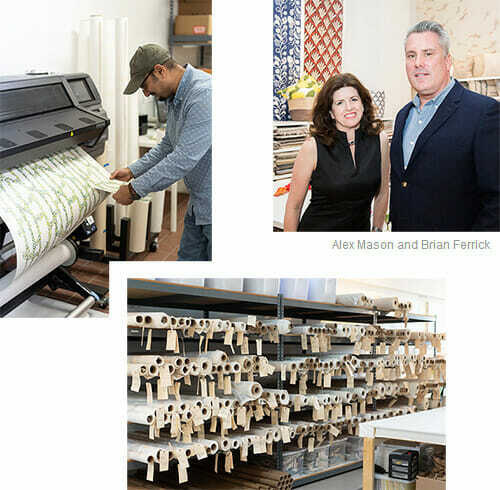 Painterly, fresh, and utterly distinctive, Ferrick Mason textiles have been coveted by world-renowned designers and their clients since they first debuted in 2008. Trained at the Pratt Institute in Brooklyn, fine artist Alex Mason created each of Ferrick Mason’s popular patterns and colorways by drawing straight from her work in the painting studio, and incorporating the instinct for color and love of naturally-inspired, organic forms that informs her canvases. The result is a fabric line that is both delicate and bold, youthful and classic, of-the-minute and rendered by hand, with graphic, abstract repeats and references to the sinuous flora and fauna that inspire Alex’s art. Ferrick Mason textiles lend themselves to a variety of applications, from the traditional to the unabashedly modern, but always achieve a transformative and special effect when used in fine interiors.